It’s hard not to be intimidated by a wine of this reputation but the Latour ’61 welcomed us into the glass with open arms - a year older and yet considerably more generous than the ’62, this was a wine of sensational Latour character. Again, those hallmark gravel and crushed oyster notes were complimented by a remarkably intense, red and black fruit palate with a sensational richness and yet lightness of touch. What can I say? If you can find it, buy it. 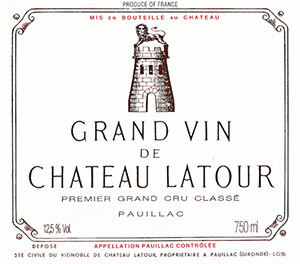 Port-like, with an unctuous texture, and a dark garnet color with considerable amber at the edge, the 1961 Latour possesses a viscosity and thickness. One of the three bottles served at the Chateau's tasting revealed a surprisingly aggressive, minty, herbaceous nose, but the other two bottles were liquid perfection, exhibiting fragrant, cedary, truffle, leather, mineral, and sweet, jammy aromatics, full-bodied, voluptuous textures, exquisite purity and concentration, and a layered, highly-nuanced finish that represents the essence of compellingly great wine.